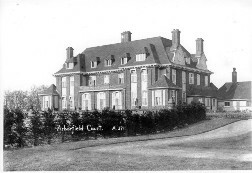 This mansion was erected between 1900 and 1909 on the top of a hill south of Arborfield Cross. When it was being built, workmen found Celtic pottery remains. Was this the site of an ancient burial mound? 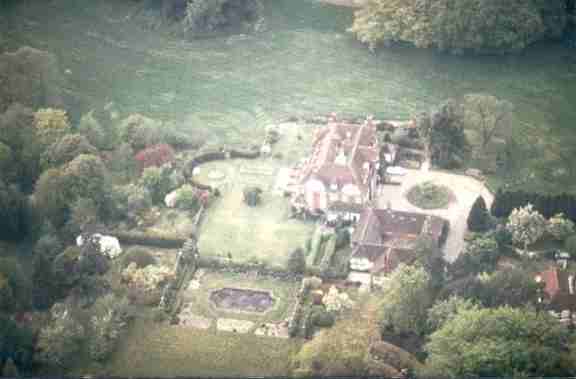 There is an image of the property when new from Reading Local Studies Library. In addition, the Library also has floor plans and interior views which you can see from here. At the outbreak of the Great War in August 1914, when the Remount Depot's operations were suddenly expanded, there was a need for more pasture land, and an arrangement was made to use land at Arborfield Court, among other locations. Mrs. Bruce sold the Court in 1916 to Mr. and Mrs. Prescott; a Furniture Auction was held in October.